This converter allows you to directly plug the antenna cable from your game console in to a TV set without needing a manual or automatic switchbox. 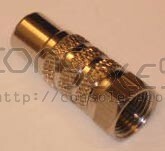 These adapters directly connect your game console directly to the television Antenna jack instead of the old standard "TV/GAME" switchbox. Switchboxes never worked very well even when new, and most of them have not aged gracefully. If your old Atari, Colecovision, or other game console is prone to on-screen static or interference, the switchbox may be to blame.